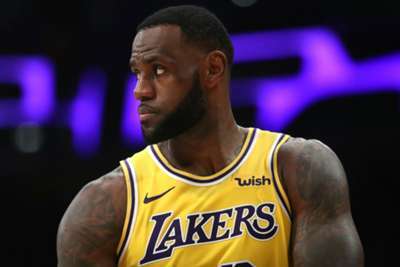 LeBron James vowed to "never cheat the game" after starring for the already-eliminated Los Angeles Lakers with a triple-double in their 111-106 victory over the Sacramento Kings. The Lakers' hopes of reaching the playoffs were extinguished last week, meaning James will not be involved in the postseason for the first time since the 2004-05 season. Having appeared in each of the previous eight NBA Finals series for either the Miami Heat or the Cleveland Cavaliers, James could be forgiven for easing off as the Lakers' disappointing season winds down. Yet after scoring 29 points, making 11 rebounds and providing 11 assists against the Kings on Sunday, James said his passion for the sport meant his effort level would remain high. "I would never cheat myself," James said in his on-court with Spectrum SportsNet. "I know we're out the playoff race, but if I'm on the court, I'm going to play how I play, and I play to win. So I will never cheat the game. "There's such a thing called 'game gods' - and they're watching no matter what you're doing. It's our obligation to go out and be a professional, and that's what I'm about." Lakers coach Luke Walton believes James' attitude stems from the fact he is one of the NBA's leading figures. "I've talked to 'Bron sporadically throughout the season," Walton said in his post-game news conference. "He knows it and I think he takes it very serious. "He's been the face of the NBA for however many years now. He's aware of that and I think he takes that responsibility very seriously."